1. 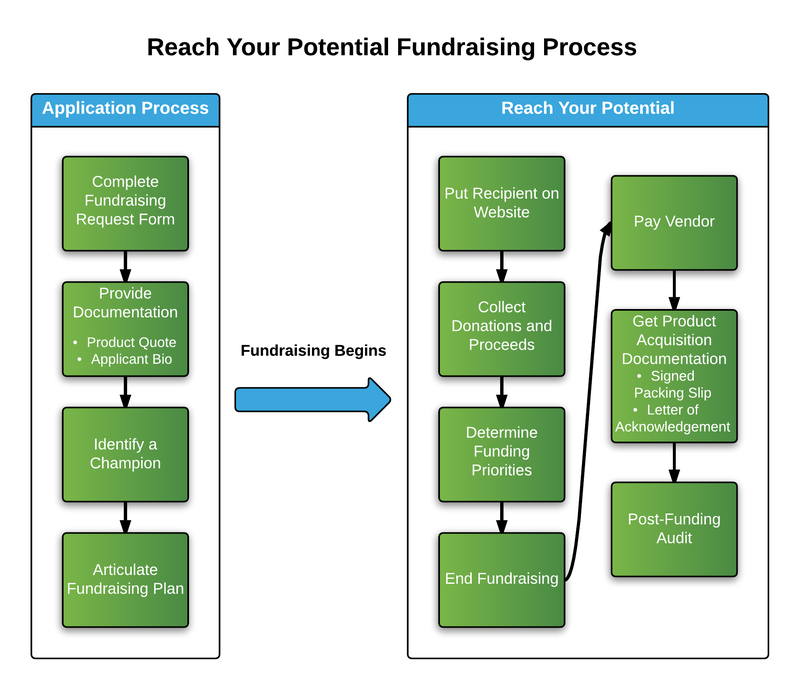 Develop a greater understanding of the entire fundraising process of ReachYourPotential. 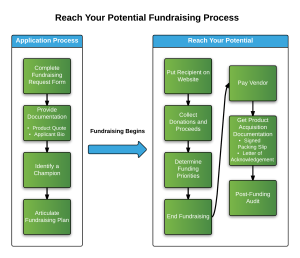 • A fund-raiser champion – This can be the individual or a parent, sibling, teacher, counselor, health care professional, or other individual who knows the individual and can dedicate some time every week to making sure the campaign stays on track and with whom we can communicate. Include their name, relationship with the recipient, and contact information. • A well-written but short biography of the individual who will receive the assistive device. Don’t worry if you aren’t a strong writer, just provide us with a good overview of who this person is and we will help you write a compelling and brief biography. Include the individual’s full name, city or state, source of their mobility limitation (i.e. Cerebral Palsy, paralysis, ALS, etc. ), where they go to school or if they work, and other pertinent information that will help give readers a sense of who this is and why they should help them. • A photo or video of the individual (two or three photos and a video at the most). • A description of what assistive devices are needed, and how they will impact the life of the recipient. Be specific. The assistive devices can be from any manufacturer or vendor, but must be commercially available in the United States. Motor vehicles are not eligible. Appropriate items include wheelchairs, wheelchair accessories, and mobility devices. • A list and contact information for possible networks that may participate in the campaign (e.g. ; school, church, civic organization, etc). • If the recipient is a minor, clearance from a parent or guardian to conduct the campaign on the recipient’s behalf.